How a team of Harvard geeks is using a satellite—plus a little help from George Clooney—to rewrite the rules of humanitarianism. 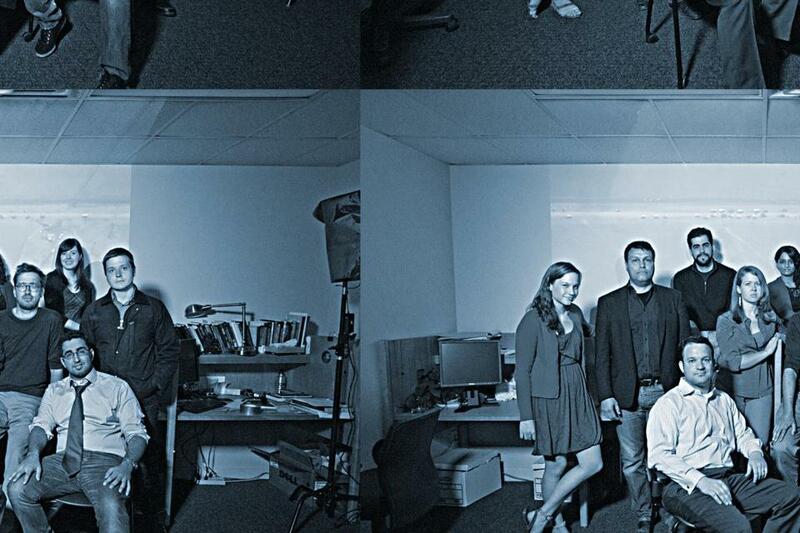 Nathaniel Raymond, Brittany Card, Isaac Baker, Ziad Al Achkar, Jody Heck, Vincenzo Bollettino, Luis Capelo, Caitlin Howarth, Benjamin Davies, and Sunetra Bane of Harvard’s Satellite Sentinel Project. LATE-AFTERNOON LIGHT slants outside the windows of a Harvard Square conference room where half a dozen twenty- and thirtysomethings huddle around a table covered with laptops, several cups of coffee, and one falafel sandwich. It could be a grad student study session, at least until a young woman named Brittany Card stands up in front of a white board covered in drawings of soldiers and tanks in Sudan. “I’m just going to go through the sitrep from memory, so everyone’s on the same page,” Card begins, sounding more like a general in uniform than a 23-year-old in pearls and a plum-colored dress. Her situation report on the afternoon of March 27 goes on to cite massive troop movements, aerial bombardments, and a flurry of acronyms. As she talks, the group looks at satellite images of scrub desert and buildings projected on a pull-down screen at the far end of the room. Last year, South Sudan split from Sudan, and the North African countries have teetered on the verge of war ever since. A day earlier, Card continues, the fragile cease-fire seemed to snap. It appeared that Sudan Armed Forces (SAF) had bombed an oil field in South Sudan; meanwhile, southern militias from the Sudan People’s Liberation Army (SPLA) had apparently attacked an oil field in the north. The question was, who started the fighting — and what would happen next? Card is the data analysis coordinator for The Satellite Sentinel Project, which has been asking questions like this since late 2010, when a foundation cofounded by actor George Clooney put up the money for an audacious project to use satellites to spy on combatants in an active conflict zone. Operating out of the Harvard Humanitarian Initiative, the project’s goal is to protect civilians, but to do that the team has had to learn to think like military commanders. “Is this a SAF play or a southern play?” asks Satellite Sentinel Project’s director of operations, Nathaniel Raymond, a 34-year-old with mussed-up hair and tortoiseshell glasses. “Whoever’s play it is,” replies Benjamin Davies, the 34-year-old fast-talking deputy director, “we had rapid events take place” on the border. 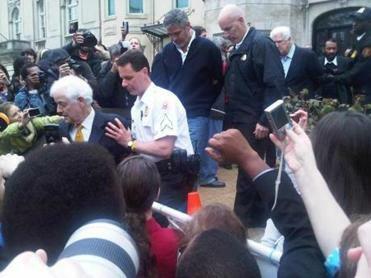 A cellphone photo of George Clooney being arrested outside the Sudan Embassy in Washington, D.C., on March 16. And while they weren’t watching. Like everyone else, they had been focused on Sudan’s Kauda Valley, where the Sudanese government has hemmed in rebels and civilians alike, blocking food shipments and conducting bombing raids that drive them into the surrounding Nuba Mountains. The group is fond of movie analogies. Before the night is through, they’ll reference Harry Potter, The Matrix, WarGames, and The Hunt for Red October as part of their unusual mix of war-room bravado, nonprofit earnestness, and dorm-room antics. Suddenly a thought occurs to Raymond: What if the SAF troop buildup in Kauda is a trick to draw in southern rebels? He slams the table. “Oh man, it’s obvious. You draw them in and then you hit their flanks.” He points to an area in Sudan by the cities of Muglad and Babanusa, where tanks dropped off by train would have an uncontested route to the border. In minutes, Card finds that the nomads usually seen in the region are much farther south — that could mean they’ve been driven out. 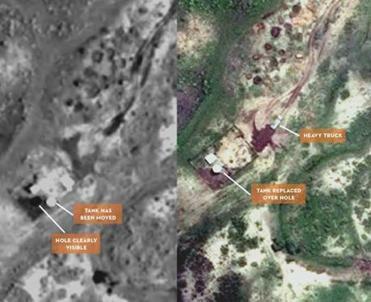 The team’s manager of imagery analysis, Isaac Baker, 32, calls up satellite shots that show roads being built from Muglad and tanks stationed in Babanusa. The evidence is mounting. This theory would be a change from the one the Satellite Sentinel Project has been building. Just a week earlier, on March 16, Clooney and other activists led a protest in front of the Sudanese Embassy in Washington, D.C., to draw attention to the plight of the refugees in the Nuba Mountains. “It’s about to start raining, and once it starts raining there, thousands of people are going to die,” the actor said. He then crossed a police line and was arrested, and his message was broadcast everywhere from CNN to TMZ. Now, however, the Harvard group suspects everyone was looking at the wrong spot. If their theory proves true, they will have predicted an invasion before it happened. If it’s not, they will have wasted thousands of dollars in free imagery from a satellite company that has already given them millions’ worth, and taken their eyes off the real conflict. “How confident do we feel about this?” Raymond asks. 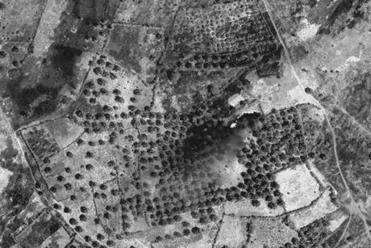 A satellite image, highlighting a Sudanese bomber, that Clooney used in his March 15 testimony before a Senate committee. Whenever violence had occurred in Sudan in the past, the government had always been able to deny it. Sitting in the desert one night with Enough’s cofounder, John Prendergast, Clooney asked, “Why is it that you can Google Earth my house, but you can’t do the same thing to war criminals?” There had to be a way, he continued, they could turn satellites into the humanitarian equivalent of paparazzi. It took less than three months for the Enough team to launch the Satellite Sentinel Project, with $750,000 in seed money from Not on Our Watch, the humanitarian foundation Clooney started with actors Don Cheadle, Brad Pitt, Matt Damon and others. Hutson got Raymond to direct the operations of the project, and Raymond got Harvard to host it. Finally, commercial satellite company DigitalGlobe agreed to donate images — which can cost thousands of dollars apiece — and helped train Isaac Baker and student interns to analyze the footage. With four staff members and a half-dozen interns, the new team quickly learned to search for clues of impending attacks. Nine months after launching the project, they detected SAF troops gathering within 40 miles of the Sudanese village of Kurmuk. After the Satellite Sentinel Project issued a report about it over the Internet, more than 1,500 villagers fled across the border to Ethiopia. By the time the invasion took place, there were few people left to kill. “We saw that coming and went all Paul Revere up in that,” Raymond says. 2011 images documenting the movements of a water tower that allegedly concealed a mass grave. Last summer, for instance, the Satellite Sentinel Project alleged Sudan was killing civilians and burying them in mass graves in the town of Kadugli. Yet in a Washington Post article, the United States’ special envoy to Sudan said US intelligence reports showed no evidence such graves actually existed. The team kept looking. “We had multiple people speaking to us saying bodies were being buried near a [particular] water tower,” recalls Benjamin Davies. One day, Ben Wang, an 18-year-old intern from Tufts, was looking at satellite images when he noticed the tower had moved. He pointed to a hole in the ground where it had been. “The grave is there,” he said. Over the next month, the team watched the tower move back to its original place, covering up the grave. In August, they released a report and, by year’s end, Time magazine reported that the International Criminal Court was investigating war crimes based largely on information gathered by the group. Baker kept at it. After days of triangulating from nearby airstrips and squinting at his computer screen, he finally noticed a speck he hadn’t seen before — it was an Antonov AN-26, a Soviet-era cargo plane Sudan uses as a makeshift bomber. “This was literally the smoking gun,” says Davies. 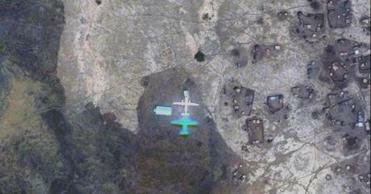 Two days later, Clooney showed the satellite image to the Senate committee, with the Antonov outlined in blue. He credited the Harvard team with the evidence. After more than an hour, Baker finds some new checkpoints and signs of tank movements, but still no smoking gun. Raymond prepares to call it a night. In the days to come, Baker will find two tanks that could signal an invasion. By late April, news reports would indicate the region edging ever closer to war. After South Sudan seized the oil-rich Sudanese town of Heglig, Sudan bombed a bridge in South Sudan, killing several civilians. Despite pleas from the United Nations and African Union, the violence would continue. The team may have been incorrect about the location of attacks, but they had accurately predicted SAF was mobilizing for a fight. That realization is still weeks away, though, and tonight the mood is somber. “Should we move [the satellite’s focus] south or stay tight on the border?” Raymond muses aloud.